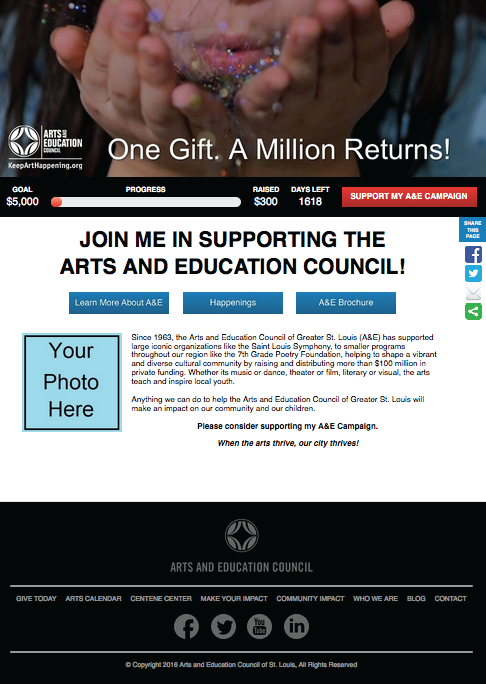 Become an advocate for the arts in St. Louis by starting a personal campaign. We make it easy to use your campaign page to raise funds for the arts in our community. To learn more about how you can use a personal campaign page and to set one up, please contact Heather Edwards, Workplace Giving Campaign Manager, here. Below is an example of what your personal giving campaign could look like. The A&E staff can work with you to create a page with personalized images and messaging for you to share with friends and family.